2 Bedroom Maisonette For Sale in South Petherton for £225,000. Interesting stone built cottage style maisonette of character forming part of the former English Courtyard Association with resident manager. Large communal gardens, garage and local amenities are within reach. South Petherton is a small residential country town with a village atmosphere set in attractive surrounding countryside one mile from the A303 roadway and offers a wide range of shopping facilities, two schools, library, inn, post office, churches, doctor & veterinary surgeries, chemist, tennis and bowling clubs and 'bus services to neighbouring towns and villages. Yeovil is ten miles, Crewkerne (Mainline Station to Waterloo) six miles, Ilminster six, the county town of Taunton (M5 Motorway & Mainline Station to Paddington) eighteen and the South coast at Lyme Regis twenty two miles. This interesting and spacious cottage style maisonette of character was converted from a former granary and is built of stone under a tiled roof. The property is situated towards the town outskirts and is within reach of the wide range of local amenities and open countryside is nearby. It forms part of the Hayes End Manor which in turn is part of the former English Courtyard Association with the benefit of a resident manager. 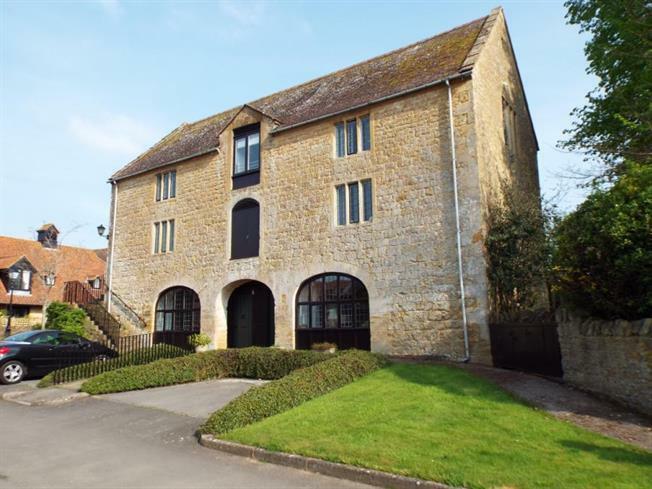 Particular features include mullion windows, exposed beams, two bedrooms, first floor bathroom/WC, entrance hall, downstairs cloaks/shower room/WC, attractive sitting/dining room, kitchen with range of units complete with hob and oven, electric heating and the carpets are included. Outside there are large communal landscaped gardens and enclosed courtyard areas. There is a garage nearby. Applicants are recommended to view the interior. Staircase rising with stairlift, recess under, storage heater. Leaded double glazing window with window seat, side aspect double glazed window, two electric storage heaters, TV point, telephone point, picture rail, ceiling beams, three picture lights. Double glazed window with deep sill, range of units comprising work surfaces with cupboards and drawers under, stainless steel sink unit, built in electric halogen hob, built in electric oven and grill, extractor fan, tiled splashbacks, ceiling light, slimline electric heater, plumbing for washing machine, space for upright fridge/freezer, telephone point. Mullion window with secondary glazing, two built in double wardrobes with shelving above, wall mounted cupboard, single mirror fronted wardrobe, slimline panel heater. Electric panel heater, Airing Cupboard with hot water cylinder. Double glazed window, two built in double wardrobes, shelving above, slimline panel heater. Panelled bath with mixer tap and shower attachment, low level Wc, wash hand basin, tiled splashbacks, striplight, electric heated towel rail, wall cupboard, electric fan heater, extractor fan, shaving point. Large landscaped communal gardens with sweeping lawns, pathways, flower borders, ornamental shrubs and trees, sitting out areas and enclosed courtyards. Occupants of Hayes End Manor must be 55 years of age and older. There are resident managers and large communal gardens. Also there is a guest suite, parking and laundry room. The property is Leasehold with 150 year lease from 1988. There is a service charge. By arrangement with the Agents at their South Petherton Office (01460) 241880.